Troubled-but-stylish rock frontman Scott Weiland (Stone Temple Pilots, Velvet Revolver) has -- taking cues, perhaps, from sartorial colleagues Justin Timberlake and Kanye West -- made the next logical step in his musical career: he’s designed a line of clothes. Weiland, as well-known for '90s grunge ballads and energetic onstage performances as for past drug addiction, divorces and arrests, has attached his name to a line of posh rock-wear for British clothing line English Laundry. 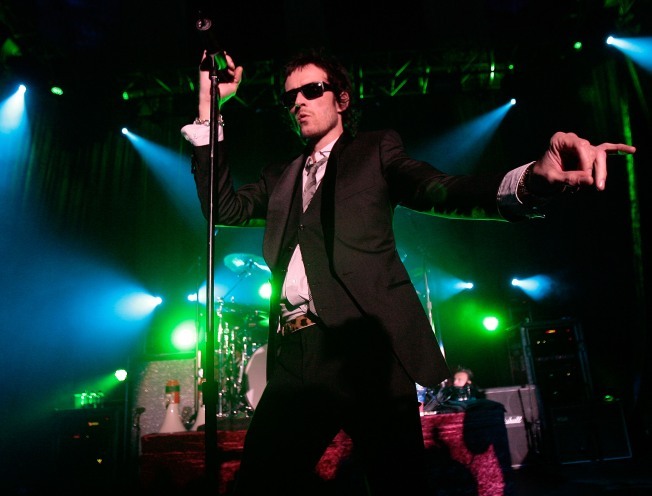 Weiland will debut the line Wednesday night here in LA by way of a private solo performance at The Roxy, unofficially kicking off the Sunset Strip Music Festival, which starts Saturday. And by "private show" we mean industry insiders only -- no tickets are being sold to the public. The collection, however, is the public's to own. It can be perused and purchased on globalrebels.com and includes all the mix-n-match separates one would require to look like a respectable, modern day rock star: tailored pink pants, silk ties, embroidered vests, velvet jackets and the like. Bad-boy attitude not included with sale. You'll have to muster that on your own.